IlyaM: GetStrongAtJoseki volume 2 shows this sequence as one of 34PointLowApproachDiagonal joseki. Charles I wonder if there are many examples of pros playing this, though. Later in the same book in the exercise 61 the book says that is mistake in this diagram. Charles As played by Go Seigen in 1931. There are some very sloppy things in the Get Strong books. As the answer how to punish the mistake the book gives following sequence. The book says that as result of the sequence white will be able to take one of critical points: either 'a' which makes marked three stones wall inefficient or 'b' which neutralizes influence of the black stones. This leads me to the question. Why point 'a' is not so "critical" when joseki sequence is being played? 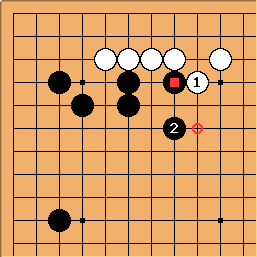 Why it doesn't give white the advantage compared to non-joseki variation? Klaus: I guess, the answer has something to do with libertys. 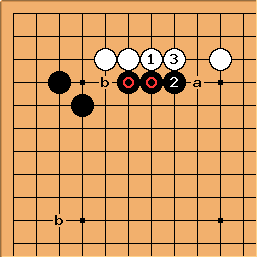 In the joseki example, the stones have 5 libertys and are part of a good, connected shape. (white cannot cut them from the corner stones. The 3 stones in the non-Joseki have only 4 libertys, after white plays at a, so they are much weaker. A cut at b will be a threat later. 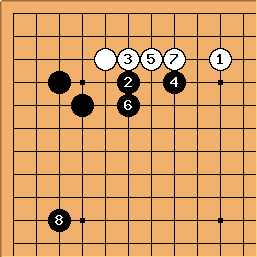 Black is less thick than in the joseki. Charles An easy one, really. If , is quite good. 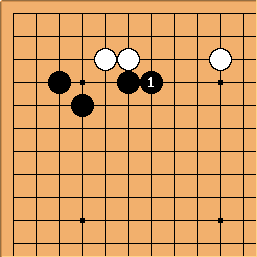 This exchange is not so interesting for White, because the top side group is already strong. The stone is light. Which is why it is better not to connect to it. Dropping back like this seems to be good for Black; because his problem is more about how to enclose the left side, than putting further pressure on White. A play at the circled point seems a bit thin. bud1027 In a shape like this, is a critical point to attack black's weakness. is ,so-called, middle point of three stones. Hard for black to find proper moves against .